Most restaurants also have bars, but not all restaurants have a bar equipped to create your drink of choice. Some don’t have the brews, wines, or liquors on hand, and others don’t have a talented mixologist behind the bar. Offering modern Latin cuisine, Table Mesa is a popular spot for locals and visitors alike. It features a relaxing ambiance, live music, cold refreshing beer, a splendid wine selection, and creative classic and signature cocktails. You can count on the wait staff to be friendly and knowledgeable. In the casual lounge area on the North side, Tusk and Trotter, offers an extensive list of beer including domestics, imports, ambers and brown ales; India pale ales; wheat beers; stouts; and blond, golden and farmhouse ales. As you can see, beer enthusiasts will be delighted with the beer selection. There’s also a good selection of wine by the glass or bottle including reds, whites, blushes, champagnes, and red and white reserves. In addition to their beers and wines, they offer a terrific selection of house-infused cocktails including several Bloody Mary flavors, martinis, and an Award-Winning Pink Lady. Relax and enjoy your libation of choice here. Enter off the Spring Street entrance and literally descend down into a unique, cozy cave-like restaurant and bar. Specializing in wine on tap, including those from around the world and fabulous cocktails including classic cocktails made with a fresh Grotto twist like their Moscow Mules served in copper mugs, their Basil Gimlets, and their Fresh Mint Mojitos. The service is stellar, the ambiance is superb, the food is delicious, and you just can’t beat those awesome drinks. Bordinos offers a brilliant and enormous selection of wines either by the glass, half bottle or full bottle including Rose, White, Red, Sweet and Sparkling. They also have a good selection of wine flights including some delicious made-in-Arkansas wines. Not a wine lover? Let their mixologists whip up a hand-crafted martini, specialty on the rocks, or classic cocktail for you. In addition, Bordinos also has a nice selection of beer including three on draft. Many say that Theo’s has the best happy hour in Fayetteville! It has a lounge inside and weather permitting, a terrific patio outside. Theo’s offers white and red wine flights, and also sells wine by the glass or bottle. There are always two local brews on tap, and there’s also a good selection of bottled beer. In addition, they also offer a delicious $5 House Cocktail. Let one of their talented bartenders create something special for you. Complete with beer, wine and martinis, the bar menu offers a wide variety of libations to please everyone’s preference. The beautiful martinis are really something to see, and they are delicious to boot. Try the Ultimate Infused Dirty Martini or the Cosmopolitan. Beer selection includes crafts, specialties, imports and classic domestics. Kick back, and have a cold one. Bonefish has a diverse wine selection that offers perfect pairings regardless of the entrée. Houlihan’s is famous for its laid back atmosphere and vast array of drinks including micro-brewed beers, mini martini flights, and wide array of wines. Synonymous with good food, good drinks and good friends, Houlihan’s provides the perfect environment for a fun-filled gathering. Foster’s is a micro-brewery with 82 beers on tap. They also have a fabulous selection of wines and hand-crafted cocktails. 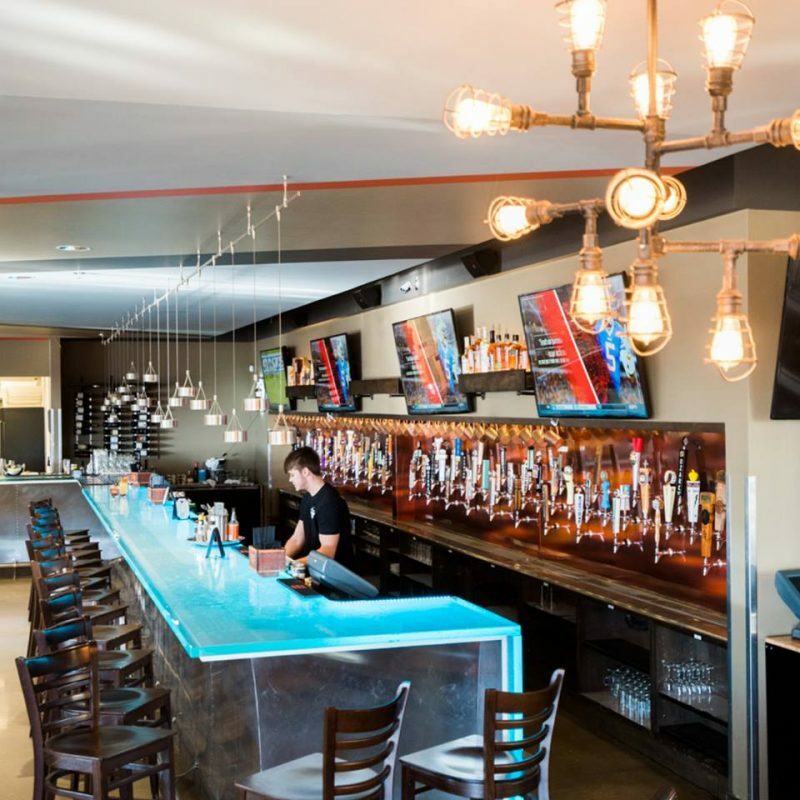 Mainly a gastropub featuring freshly prepared farm-to-table food in a casual upscale environment, Foster’s has a stunning patio with a huge fire pit for your enjoyment. Join them on Wednesday evenings for Wine Down Wednesdays featuring wine for $4 a glass. Get ready for a mouthful of flavor with every bite regardless of which of the many menu options you choose. Food is fresh, cooked to perfection and fresh to order. Excellent bar area with beer, wine and delicious sangria. 28 Springs has many local beers on tap, makes superior cocktails, and has a beautiful selection of wines. Their spirits are curated from around the world including some thirty different Bourbons, more than seventy whiskies and twenty plus bitters. Cocktails range from Classic to Imported to Contemporary. Unsure about which whiskey to try, give the popular whiskey flights a try. In short, this bar is equipped to deliver your favorite drink in short order. You won’t be disappointed here!